Whether you find yourself falling in love with the double hearts or the two tone look of this hammered double heart pendant in 14K two-tone gold from Apples of Gold Jewelry, you can't help but admit this unique looking pendant is a stunning and fun choice! 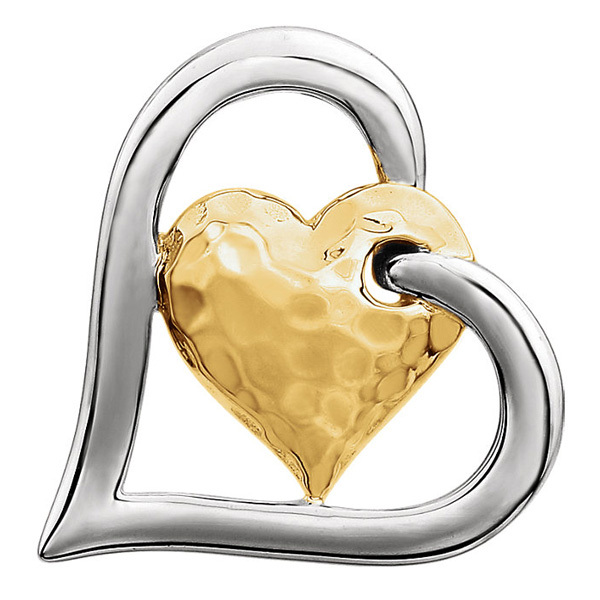 The pendant, which measures 1 inch by 3/4 inch in size, features a sideways 14K white gold heart, which is an open design and polished, and on the inside you will see a right-side up 14K yellow gold heart, which is solid and has a hammered texture to add to the interesting look. The heart within a heart design is a favorite of many, and can be your next favorite, as well! Pair with your favorite chain or purchase a new one to go with this pendant! We guarantee our Hammered Double Heart Pendant, 14K Two-Tone Gold to be high quality, authentic jewelry, as described above.